I got this for my friend as a birthday present. The glass was thick and it made it there in one piece. Its been four years already and she still have all four. 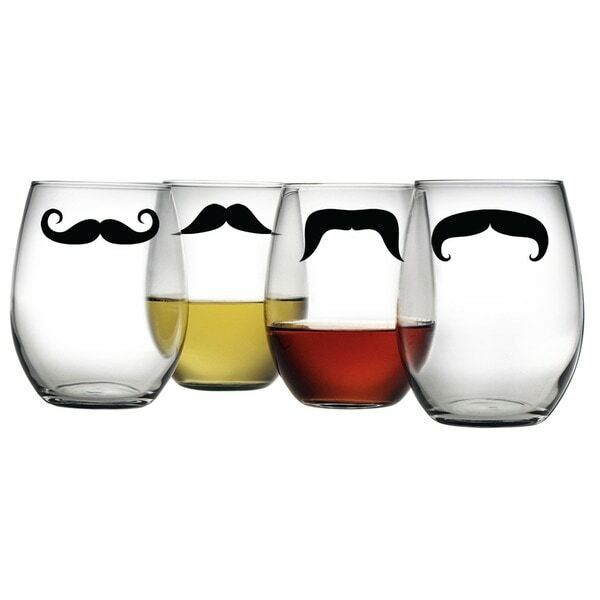 Pay homage to the great mustaches in the world thanks to this set of four stemless wine glasses. Each 21-ounce glass features a different silk-screened mustache perfect for masking any hairless upper lip. These glasses will be the perfect gift for my friend with an moustache. Love these glasses! My kids had broken my last wine glass by throwing dishes on it in the sink and I finally found something I don't have to worry about the stems breaking! I love these glasses! They are so stylish, nice and durable. I also love how fast they got here! Ordered on the 15th and received today (the 17th). Will definitely be ordering again! Very nice, felt sturdy and quality. A little thicker than I expected, heavier too. Overall good buy. You have to sign for them, they won't leave them at the door. Which moustache are you? Fun glasses. Not super thin or chunky. Haven't broken one yet in the Dishwasher, nor has the mustache faded. Great for casual dining. These are a MUST have piece to own!!! These glasses get my guests laughing so hard!! They love when I pull out the "stache" glasses!! Also, each hold about 1/2 bottle of wine when filled, and for me and my women who use these, that's GREAT!! While the quality of these glassss are great, I received a duplicate of one of them so I only had 3 styles of mustaches unlike the photo which shows 4 different ones. My BFF loved these glasses! They are sturdy for party use. Not easily breakable. Adorable and fun at parties. Like the stemless! We got these as a gift for my mother-n-law. She laughed hysterically and had a great time using them!! If you're hunting for stocking stuffers that won't break your budget, check out our list of the top 10 cheap stocking stuffer ideas to start your shopping off right.